Introducing the WeatherTech DigitalFit No-Drill MudFlap! From the creators of the revolutionary FloorLiner comes the most startling advancement in exterior protection available today. Featuring the Patent Pending QuickTurn ardened Stainless Steel fastening system. The WeatherTech No-Drill MudFlap set literally “mounts-in-minutes “in most applications without the need for wheel/tire removal, and most importantly – without the need for drilling into the vehicles fragile painted metal surface! Contoured specifically for each application and molded from a proprietary thermoplastic resin, the WeatherTech No-Drill MudFlap will offer undeniable vehicle protection. The WeatherTech MudFlap provides protection for your vehicles most vulnerable rust area. 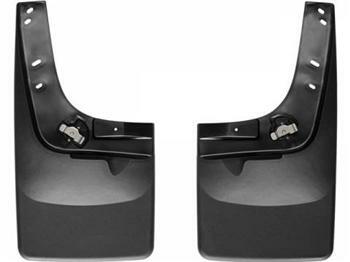 No-Drill MudFlaps protect the fender and rocker panel from stone chips, slush, dirt and debris. WeatherTech MudFlaps are proudly designed, engineered and manufactured with American made tooling in the USA. WeatherTech MudFlaps are guaranteed against faulty materials and workmanship for a period of three years from the date of purchase. Exclusions to this warranty are wear due to severe abrasive conditions and chemical contamination, such as spilled gasoline, bleach, etc.